Christabel is the founder and executive director of IHAV foundation, a non profit organization which seeks to inspire and challenge youth across Africa to envision change and ACT on it. 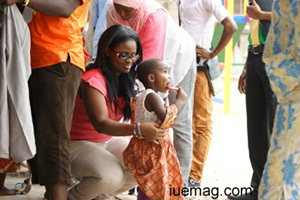 IHAV initiated a charity event dubbed Pieces for Peace to sew African print materials into beautiful clothes for orphans. The team wanted to achieve two things; to showcase incredible African prints and fabrics and also to give back to the community by putting smiles on children's faces. On the 25th of January 2014, the team of 33 youth visionaries, led by Ms Christabel Ofori, made the donation worth about $2500.00 to 5 identified orphanages across 2 cities in Ghana, clothing over 200 children. Aside the clothes sewn, the donation included food items, drinks and fruits. Christabel mentioned that gesture was to reach out to the less privileged and make them feel loved. Most people think of used clothes whenever donations come to mind but IHAV Foundation thought about giving each child two new clothes designed to fit them. In collaboration with Dress-A-Kid, another youth led nonprofit, IHAV foundation gathered pieces of fabric from individuals across the country and gave them out to benevolent designers and tailors to be sewn for the kids after gathering information on the sizes of children in these orphanages. At the orphanages, the group was briefed on how the operations of the orphanages and also shared some of the challenges they faced. They were happy for the kind gesture and greatly commended the team for its efforts. 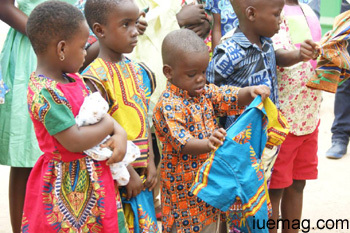 Each child was given 2 newly sewn shirts, trousers, skirts or dresses. The excitement and smiles on their faces were priceless. The younger ones were dressed up by the team whilst the older kids tried on the clothes, to make sure it fitted everyone well. They were given drinks, fruits and goodies afterwards and took some time to interact with the team and take pictures. Christabel concludes "it was a huge success and it's a call to young people to realize that small actions put together can make a huge impact".